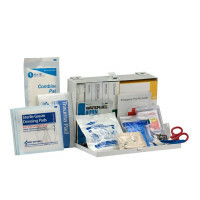 We realized that there is a need for an economical, straightforward, basic, no frills contractor first aid kit. 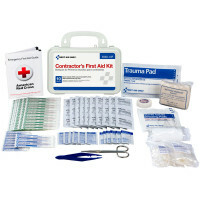 Contractor First Aid Kits were developed to address the growing and under-served first aid needs of the contractor market. 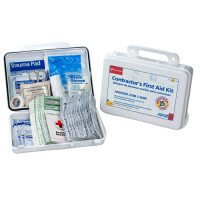 We strongly feel that every contractor should own a first aid kit to be prepared for all injuries that could happen on a job site. OSHA also requires that adequate first aid supplies should be available for employees. 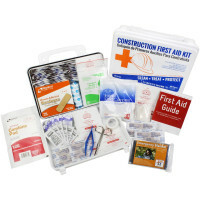 Also, these Contractors and Construction Kits are unique in that they are Doctor recommended as OSHA, ANSI/ISEA and Cal/OSHA compliant - we searched high and low for a kit that a physician would recommend to comply with California's strict OSHA guidelines for Construction and found these for you. You can even request a letter from our MD recommending this kit with your order! 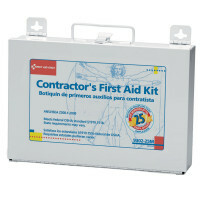 Contractor´s injuries are diverse, but their basic first aid needs are simple. Their jobs are strenuous, tiring, and the occurrence of minor injuries is extremely high. For minor injuries, an adequate first aid kit will allow the injured person or co-workers to administer first aid and get the employee back to work. 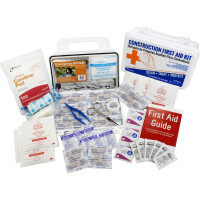 For major injuries, the contents of a construction first aid kit can be used to provide care to the injured person, before an EMT or ambulance arrives. It could mean a matter of life and death. A construction site safety survey should always be conducted to ensure that the proper first aid supplies are available for the types of injuries that may occur at any jobsite. 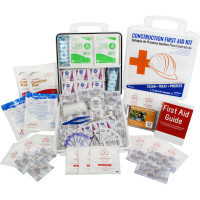 See our 10, 25 and 50 person OSHA & ANSI / ISEA Compliant Construction First Aid kits below... We've got your Construction First Aid Compliance needs covered! These kits are appropriate for Construction Work sites and Contractor use to comply with Federal OSHA regulation 1910.151(b), ANSI Z308.1-2009, ANSI Z308-1-2009 as well as Cal/OSHA 3400 section guidelines and Cal/OSHA Title 7, Subchapter 4. Construction Safety Orders §1512. Also See OSHA CONSTRUCTION BOOKS & GUIDES & Live Construction Safety Training including Forklift Safety Training & THESE KITS CAN BE CUSTOM LABELED! The tools you need to get the job done - Safely. 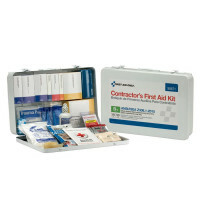 These Construction, Management, and Contractor first aid kits meet the federal OSHA regulation 1910.151(b) and the ANSI Z308.1-2009 and/or 2015 requirements. 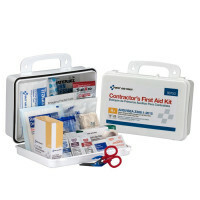 This will assure each contractor that they own a first aid kit complying with the basic requirements in their industry. 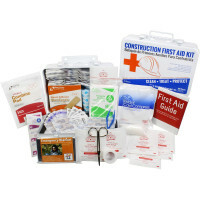 These Contractor First Aid kits contain a superior variety of quality first aid products to ensure preparedness for on-the-spot treatment of minor first aid needs. Once a first aid kit is opened, all products are very visible, well organized, and accessible, making it easy for the user to quickly identify product needed. Front label clearly identifies the type of kit, states OSHA/ANSI regulation compliance; while back contents label lists contents of the contractor first aid kit, which will assure the contractor that this product meets the needs of their workers. This will also be beneficial in a retail storefront environment where contractor will be able to view contents before purchase. Use these kits for construction and maintenance, construction, construction equipment, home construction, construction company, construction managers, construction project management, building construction, as construction material, in the construction industry, for a construction contractor, to manage construction cost, for the injury of a construction worker, in heavy construction, as a construction supply, to deal with a construction accident, as a construction tool, for house construction or other construction services. Keep at each construction site for all construction first aid needs. This will help maintain you construction safety around construction safety equipment, during road construction safety and for construction site safety. This is the ultimate new construction safety product, perfect for construction safety supply to maintain construction health and safety, as well as construction job site safety, for building construction and safety, before your construction safety inspection or construction safety audit. Construction safety management should use this construction safety solution to assure OSHA construction safety in each construction safety work zone or for construction safety for public, as well as contractor safety. Make one a part of each contractor safety plan, which should always include contractor first aid, whether you are a residential general contractor, general contractor, contractor builder services, concrete contractor, building contractor, roofing contractor, remodeling contractor, roof contractor, commercial contractor, residential contractor, dry wall contractor, electric contractor, home improvement contractor, mechanical contractor, siding contractor, masonry contractor, or residential building contractor. This is the most important contractor supply not to be found in your contractor warehouse. Also remember Required OSHA FIrst Aid & CPR Training for Construction.